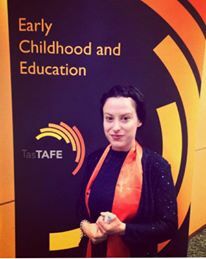 One of CREATE’s outstanding Young Consultants, Carlatina, recently completed a Diploma of Early Childhood, Education and Care. Well done! Having endured some difficult times, Carlatina proves that young people with an out-of-home care experience can really achieve anything. The following is her story.. If I wasn’t in foster care I probably wouldn’t want to be a nanny. That’s where I developed an interest for working with children. Three years ago I left foster care and was told from someone at child protection that I was going to end up either homeless, pregnant or in jail because I was in foster care. I hated this. Studying child care whilst being in foster care was a struggle. I moved foster homes in my last year of year 12, which was my choice but it affected my leaving care plan moving into independent living. I almost failed my third certificate in child care because of the stress of it all and lost my first child care job and had to do an extra year of college, during which I was starving and broke all the time. I then went on to complete my diploma. I don’t know how I got in because I wrote my application whilst I had been starving because I had no food. Other struggles I had to deal with in my neighbourhood and living environment whilst studying included gun violence, rodents and at one point I was even homeless for six weeks. It was all really hard for me to cope with at the time, but I kept going. Last year I didn’t think I was going to pass my diploma at TAFE but I did. I cried when I did. It took me two years. I proved people wrong. While there were times my foster mum and other loved ones in my life helped me during periods of struggle, there were also many times I had too much pride and chose to do things on my own. I still feel grateful for their support and I’m very happy how far I’ve come. Recently, I moved to Sydney where I now work as a nanny. Which means I am also now a new Young Consultant for NSW. While it has had its challenges, I smiled today whist partaking in my nanny duties. I kept saying to myself this is why you stayed strong, it’s why you didn’t give up despite all of your struggles. Most of all I showed people that young people in care can do anything. « CYF Grant Winner, Jacinta!